Take the #LaborOfLove Pledge Today! According to the U.S. Bureau of Labor Statistics, there were 5.6 million job openings on the last business day of June this year. In observance of Labor Day, between August 30 and September 6, Goodwill is challenging people across the nation to sign Goodwill’s #LaborOfLove pledge to spread awareness about Goodwill® and the importance of job placement and training programs for people looking for employment. 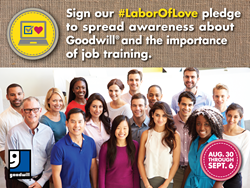 Visit http://bit.ly/LaborOfLove2016 and learn more about Goodwill and how individuals can support Goodwill’s efforts to put people to work. Goodwill is poised to leverage its workforce development network to help more individuals gain skills and earn the jobs that are open today and will be necessary for the future. Goodwill Industries International is a network of 164 community-based organizations in the United States and Canada with a presence in 13 other countries. Goodwill is the #1 brand doing the most good in the world (Brand World Value Index, 2016) and is one of America’s top 20 most inspiring companies (Forbes, 2014). Goodwill organizations are innovative and sustainable social enterprises that fund employment placement services, job training programs and other community-based programs by selling donated clothing and household items in more than 3,100 stores and online at shopgoodwill.com®. Local Goodwill organizations also build revenue and create jobs by contracting with businesses and government to provide a wide range of commercial services, including packaging and assembly, food services preparation, and document imaging and shredding. Last year, Goodwill placed 312,000 people in employment in the United States and Canada. Nearly two million people worked to build their career and financial assets by engaging with Goodwill team members. In addition, more than 35 million people used computers and mobile devices to access Goodwill education, training, mentoring and online learning services to strengthen their skills. To learn more, visit goodwill.org.